What If Australia Knifed A Prime Minister And The World Didn't Notice? Ever wondered how Australia fares on the world stage when an important event, such as a leadership challenge, occurs? Badly is the answer. And sorry, there's no way to soften that blow. Please exscue any typos or grammrTcal 3rrors, tping as faxt as i can to geg this blob in before Africa's Australia's next leadershit coup. Imagine my disappointment when the last blog I wrote becaem null and void after our Primate Minister, whom I had hampooned, was no longer occupying his orifice. But don't worry I have tucked that article away just in case our fearless new leader, Malcum Turbull, turns out to be a complete fickhead too. And yes, Australia's leadership spill did make news all the way over here in Germany. I watched, glued to my seat, hopeful of change, flicking between the two English-speaking networks available to me -- BBC World News and CNN International. 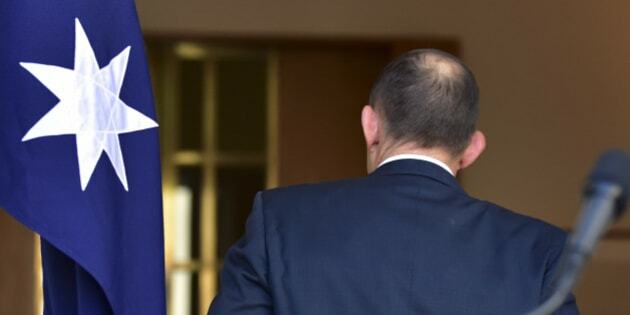 Australia's leadership spill proved to be great fodder for the BBC's political commentators. Did you know this was our fourth leadership spill in four years? I did BECAUSE THEY KEPT REPEATING IT! OVER AND OVER AGAIN! It was almost as if getting a new Prime Minister, after the last Prime Minister, after the last one before that and the one before that, was some kind of joke to them. Live crosses to Abbott and Turnbull giving their respective versions of 'I've got the numbers and will win' left me exhausted. It wasn't the speeches, oh no, no, no, it was our Imperial cousins with their 'what are the convicts doing?' attitude I found so tedious. I switched to CNN, keen to hear their perspective on our history making moment. Sadly, we didn't fare much better. In fact, we didn't fare at all. A Professor at Delta State University had been killed in another tragic shooting. They were sticking with an aerial shot of the campus, waiting, hoping for some action. They waited and hoped for a good 10 minutes while the news reader did her utmost to give the pictures of the sleepy campus a bit of 'news style' pizzazz. 'Looking now at the wing where a member of the faculty lies dead inside, while Police hunt for the gunman.' But when she said, 'We'll be sticking with these pictures, keeping you as up to date as possible,' it became obvious America had not heard the news coming out of Australia. It was our fourth leadership spill in four years, for Christ sake! This was big news. How very dare they?! Were we not worthy of America pointing their finger at us and laughing. Then again, they've got Trump doing his bit to fill that end of the market. And talking of laughing, back on the BBC journalists were now sharing their opinions on our great nation as though it were a comedy roast. They even used the 'C' word. Yep, 'colonials'. I switched back to CNN where they were debating whether the real issue is gun law or mental health? What? And WHAT? By now Australia had a new leader but America was no closer to solving their conundrum over guns and the country's apparent epidemic of mental health issues. England was drawing comparisons between our leadership issues and their Ashes win and if I didn't know better might have downed a few pints during the ad break. Given how quickly the knives come out in Canberra these days, I have the same message for Malcolm as I do for the victorious England cricket team. Dear Mr Zuckerberg, What On Earth Were You Thinking?